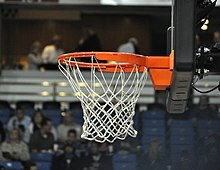 The first glass backboard was used by the Indiana Hoosiers men's basketball team at the Men's Gymnasium at Indiana University. After the first few games at their new facility in 1917, spectators complained that they could not see the game because of opaque wooden backboards. As a result the Nurre Mirror Plate Company in Bloomington was employed to create new backboards that contained 1 1⁄2-inch-thick (3.8 cm) plate glass so that fans could see games without an obstructed view. It was the first facility in the country to use glass backboards. Professional glass backboards used to break from 625 pounds (283 kg) of force or more. 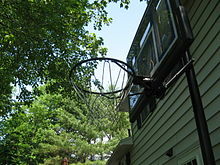 Modern professional and higher-level college play backboards do not have the glass absorbing any weight to avoid breaking. ^ a b Hiner, Jason (2005). Indiana University Basketball Encyclopedia. United States: Sports Publishing. p. 447. ISBN 1-58261-655-8.